Rugged Cast-Iron Housing: Provides maximum strength and dependability. Integral Worm and Shaft: Induction hardened to 58RC for extra strength. 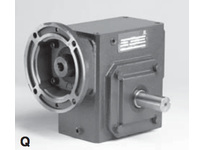 Large, Single Row Ball Bearings On Input Shaft: Absorb radial and thrust loads at higher input speeds. Tapered roller bearings are used on output shaft. Forged Bronze Worm Gears: Provide optimum balance of Strength and Wear Resistance.